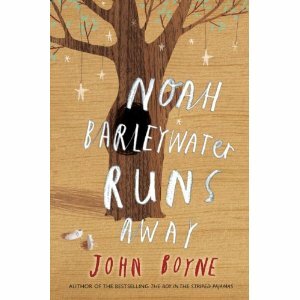 Noah Barleywater ran away from home. He was eight years old. It was time he set out for adventures of his own. The first two villages he comes to are not very friendly. As he nears the third village he meets up with a couple of talking animals. They tell him about the strange tree adn the even stranger building in the village ahead. The building is a toy shop. Noah enters the toy shop and comes face to face with walls lined with puppets, an old man, and strange happenings in the shop. As he gets to know the old man we learn more about Noah and the reason he runs away. Noah discovers a box of small puppets made by toy maker's father. AS the toy maker tells the story behind each puppet, Noah learns a lesson that helps him make an important decision. This was sonderfully written. Like John Boyne's book, "The Boy in the Striped Pajamas", you feel an element of sadness along with happy moments, only to be punched in the emotional gut near the end. I loved this book and can't wait for next years students to be the first to read such a wonderful book.